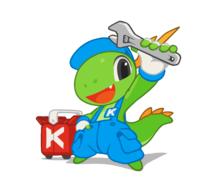 Konqi can use some tools! The module kdeutils is a compilation of various desktop utilities. kcharselect Select special characters from any fonts and put them into the clipboard. kdf Like 'df', a graphical free disk space viewer. kfloppy Format a floppy disk with this program. ktimer Execute programs after some time. printer-applet A system tray utility that shows current print jobs, shows printer warnings and errors and shows when printers that have been plugged in for the first time are being auto-configured by hal-cups-utils. sweeper Cleans unwanted traces the user leaves on the system. This page was last modified on 19 July 2017, at 16:38. Content is available under Creative Commons License SA 4.0 unless otherwise noted.